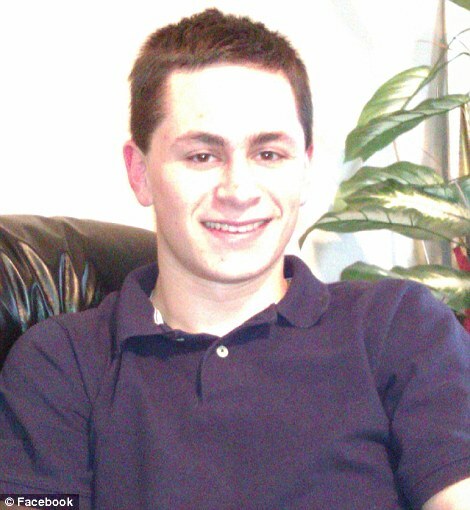 The 23-year-old who blew himself up as police tried to arrest him over a string of deadly Austin bombings has been described as a quiet, home-schooled young man. 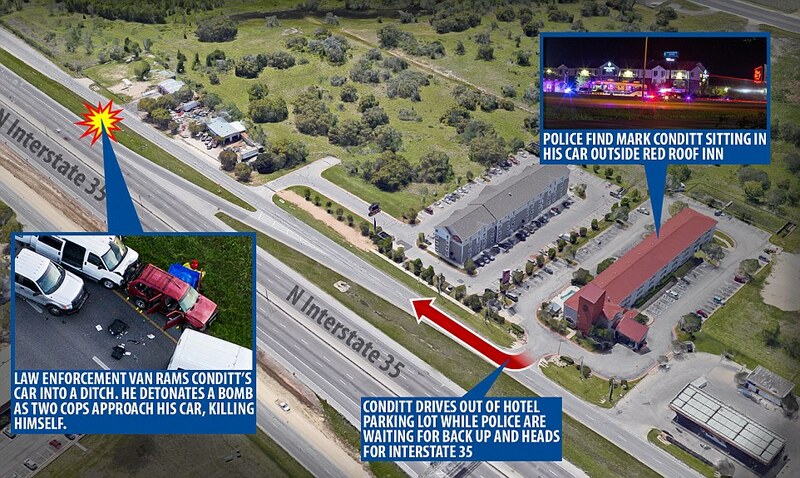 Mark Anthony Conditt killed himself when he detonated a bomb inside his SUV as police surrounded him near a hotel on Interstate 35, just outside Austin, at about 2am on Wednesday. Police closed in on the bomber after obtaining CCTV footage of him posting two packages at a FedEx office that intended to target people of color on Sunday night. Authorities are warning that more bombs could still be out there because they do not know if the bomber posted more devices prior to his death. Police started evacuating the area near where Conditt lived at about 1pm on Wednesday, fearing there could explosives there. They have since questioned his two housemates about their knowledge of the bombings. The bomber had gone on a three week bombing spree stretching back to March 2. The series of bombings killed two people and injured at least five others. 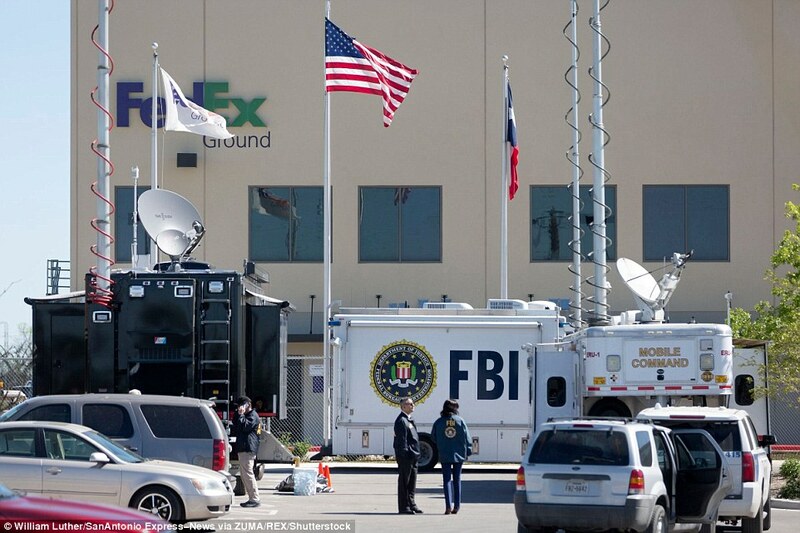 The most recent package bomb detonated at a FedEx distribution center near San Antonio early Tuesday. Police still do not know the motive behind the attacks or whether the bomber had an accomplice, but did say he wasn't previously known to law enforcement. Police believe Conditt, who previously worked as a computer repair technician and at a manufacturing company, made all the bombs himself. 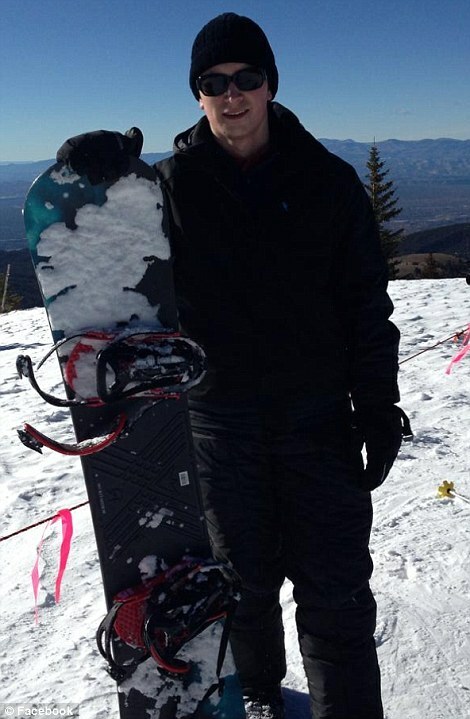 Shocked neighbors described Conditt as a quiet, studious young man who came from a good family. He doesn't appear to have left much of a trail on social media but his blog posts from 2012 indicate he was in favor of the death penalty and was against gay marriage and abortion. He identified himself as a conservative but said he was not politically engaged and said he had interests in tennis, parkour and gymnastics. Conditt was home-schooled growing up with his three younger sisters. He attended Austin Community College from 2010-12 when he 15 but didn't graduate. He was fired from his sales job at local business Crux Manufacturing in August last year after failing to meet expectations. 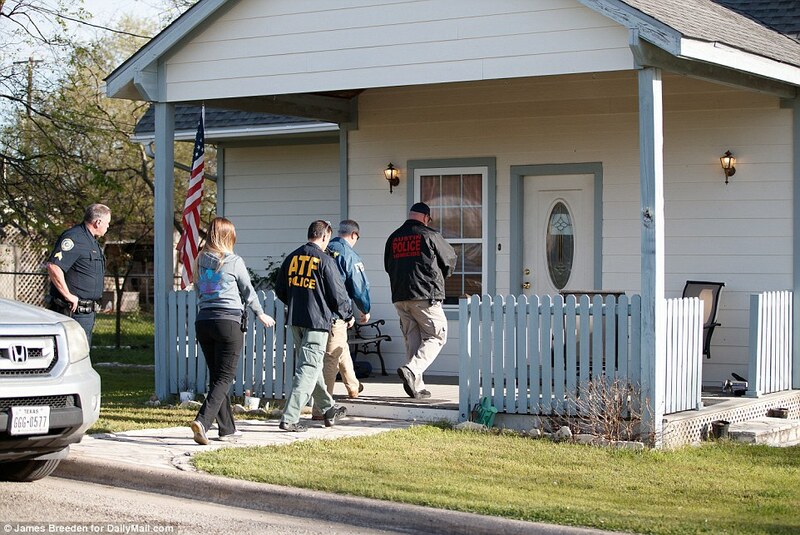 He had purchased a property in the Austin suburb of Pflugerville last year and neighbors told the Statesman that he had been living in that home with several housemates prior to the bombings. His parents Danene and Pat Conditt lived in their family home - a tidy white clapboard, two story house - not too far away. Neighbor Jeff Reeb, 75, told DailyMail.com that Conditt was the eldest of four children and he moved out several years ago. 'It doesn't make any sense, none of it,' he said. 'I'd see him when he came back to visit his parents. He'd drive up in his red truck and stay two or three hours. 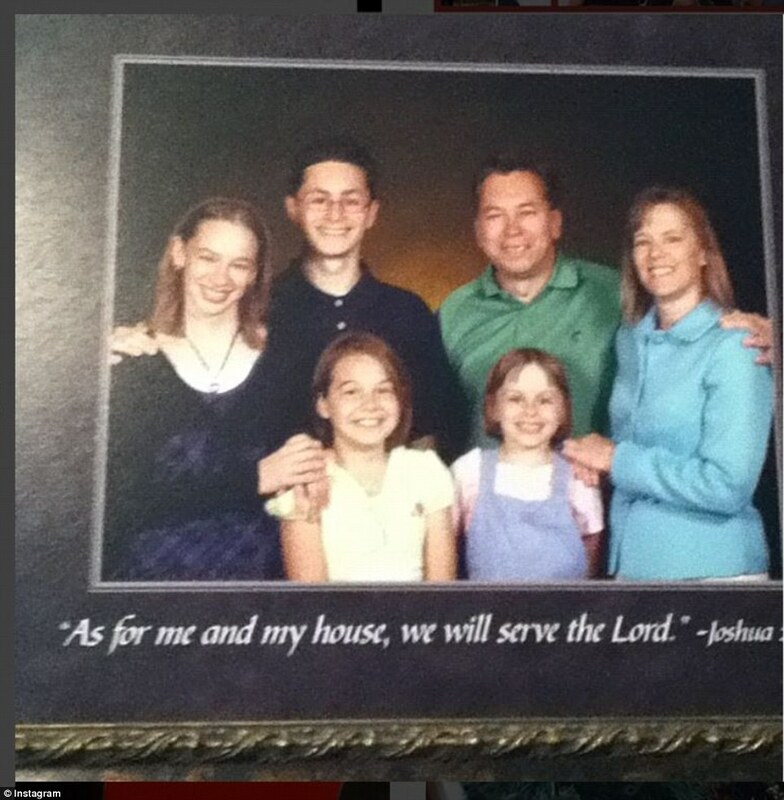 Other neighbors described the Conditts as a 'nice Christian family'. A lone police officer stood guard outside the family home as one of Mark's sisters ushered FBI and ATF agents inside on Wednesday just hours after her brother had blown himself up. Gov. Greg Abbott said Conditt was apparently unemployed when he began planting bombs. Abbott added that some of the equipment Conditt used was purchased from Home Depot. He said that among the items the bomber purchased at Home Depot were five signs saying 'CAUTION CHILDREN AT PLAY.' He said he was told a tripwire bomb that injured two men in Austin on Sunday was tied to one of the signs. Austin Police Chief Brian Manley said officers used CCTV, cell phone data, witness accounts and store receipts to track the bomber to the hotel north of the city. When officers arrived at the hotel, the man was sitting inside his vehicle and police called for backup before they attempted to make an arrest. As reinforcements were arriving the man left the hotel and police followed him. The suspect pulled off the city's main highway and brave officers rammed his car to stop him, knowing it was likely packed with explosives. 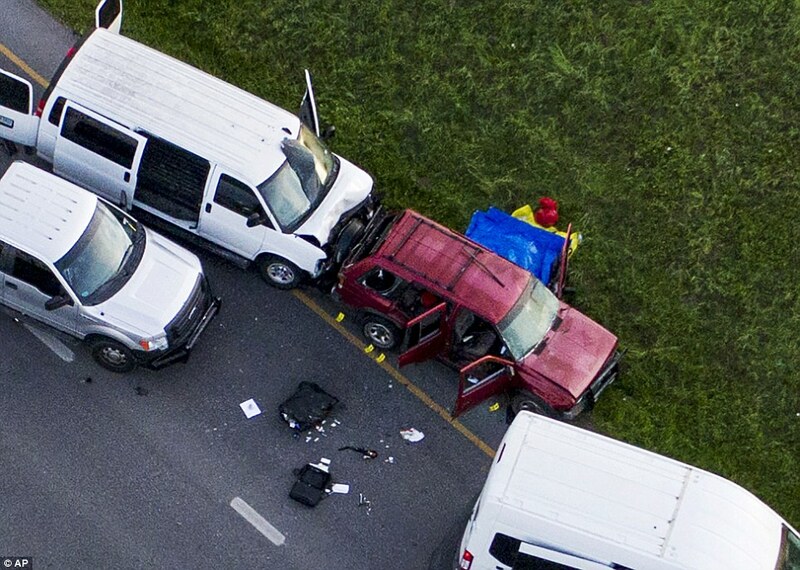 Two Austin police officers were approaching his vehicle when he detonated a bomb. One officer fired at the vehicle and the other sustained a minor injury after being thrown back when the bomb went off. The bomber's death came just hours after CCTV footage emerged showing the suspect at a Fed-Ex office in the south of the city. Images show the man wearing a disguise and delivering two packages to the store around 7.30pm on Sunday. It appears he was wearing latex style gloves at the time he posted the packages. One of the packages subsequently exploded on a conveyor belt at a FedEx sorting facility outside of San Antonio in Schertz just after midnight on Tuesday. 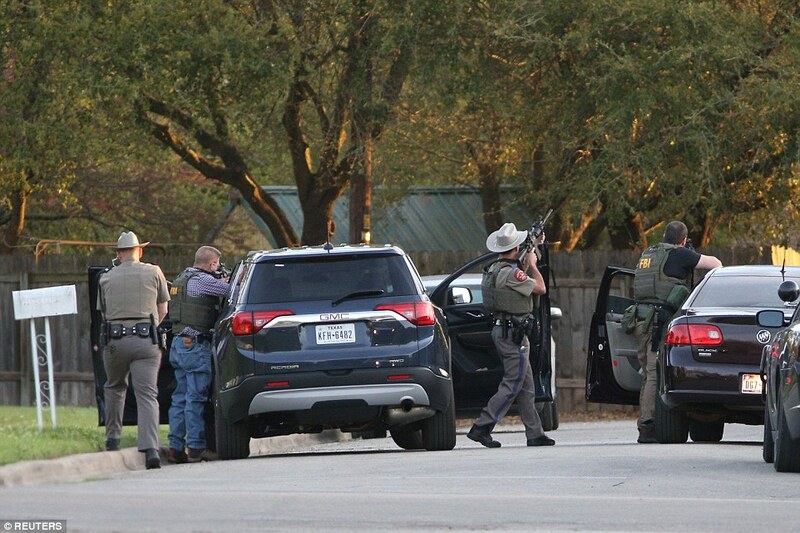 The other was intercepted at a facility near Austin airport and was later confirmed to contain a bomb. Law enforcement sources told KUVE that the tipping point in the investigation came on Tuesday at about 9pm after the CCTV footage emerged. It led police to the suspect's home and allowed them to collect cell phone data that enabled them to track him to his hotel. Authorities also got information from Google and from the suspect's computer history that confirmed the suspect was looking at information on where to ship devices. Based on that information, police were dispatched to two homes on Tuesday night to check for packages. The bomber is understood to have used 'exotic' and foreign batteries ordered online from Asia to make the bombs, NBC reports. Law enforcement said the signature trait is what helped them quickly link all the bombings together. It is not known if the suspect was planning to deliver a seventh device when police stopped him. Chief Manley said it is not clear why he tried to leave the parking lot of the hotel. Chief Manley has warned residents not to let their guard down yet, saying there was a possibility that more bombs had yet to be found. 'We don't know where this suspect has spent his last 24 hours and therefore we still need to remain vigilant to ensure that no other packages or devices have been left to the community,' Manley said. 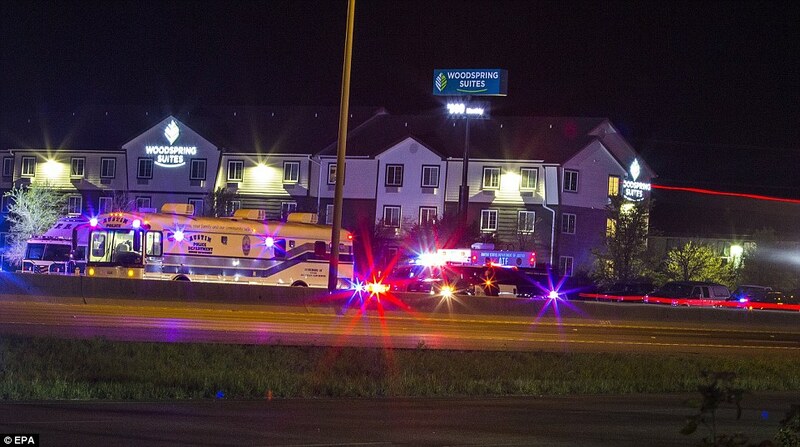 The I-35 was closed off in both directions following the explosion and officers are set to remain on scene until their investigation has been completed. Austin PD homicide detective David Fugitt said the Conditt family was cooperating 'above and beyond' what police could expect. He said a ballistics sniffing dog had been brought to the family home on a quiet cul-de-sac later on Wednesday but stressed that was just a precaution. He said police have no information that Conditt's family had any knowledge of Mark's bombing campaign. He said the family will issue a formal statement later Wednesday. President Donald Trump, who was earlier criticized for failing to speak out over the shootings, tweeted 'Austin bombing suspect is dead' on Wednesday morning. 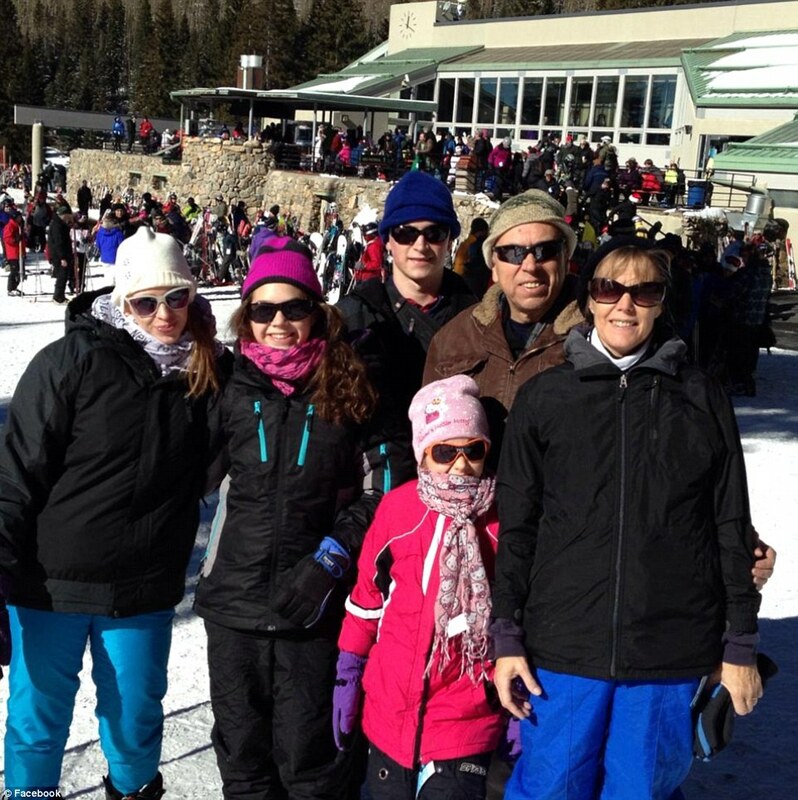 'Great job by law enforcement and all concerned,' he added. The series of bombings killed two people and injured at least five others, unnerving residents of Austin, a city of some 1 million people. 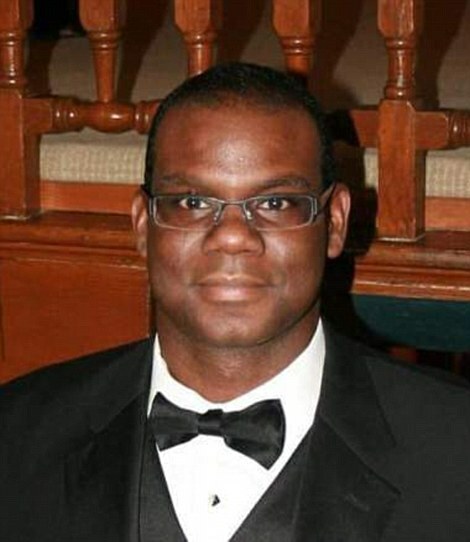 The first incident occurred on March 2 when a package bomb exploded at a northeast Austin home, killing a 39-year-old Anthony Stephan House. Two more package bombs then exploded further south on March 12. 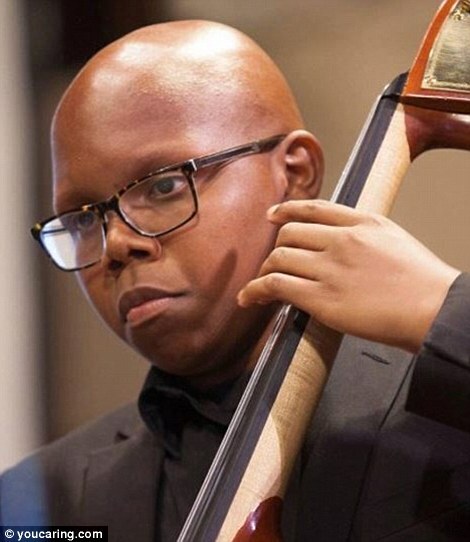 Draylen Mason, 17, was killed and his mother was wounded after they opened a package in their kitchen. A 75-year-old Hispanic woman named by family as Esperanza Herrera was severely injured when a package bomb exploded at her home a few hours later. On Sunday, two white men aged in their 20s were badly injured when they triggered a 'near-invisible' tripwire linked to another explosive device. 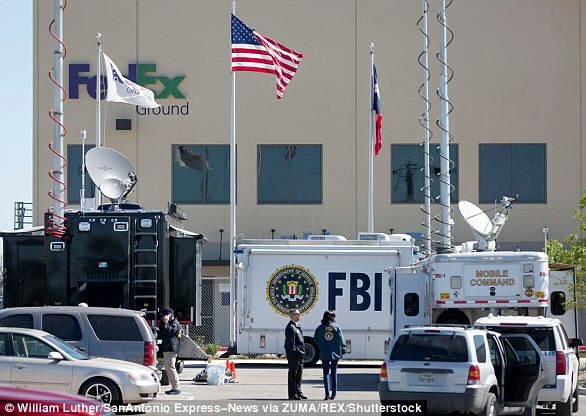 A female employee was wounded at a FedEx facility in San Antonio just after midnight on Tuesday when a package exploded while moving between conveyor belts. The package had been posted from a FedEx office in the Austin area and was addressed to a home in Austin. Hours later, a bomb was discovered at another FedEx facility near Austin airport but was found before it detonated. The package was posted from the same address in Austin as the one that exploded earlier in the day. 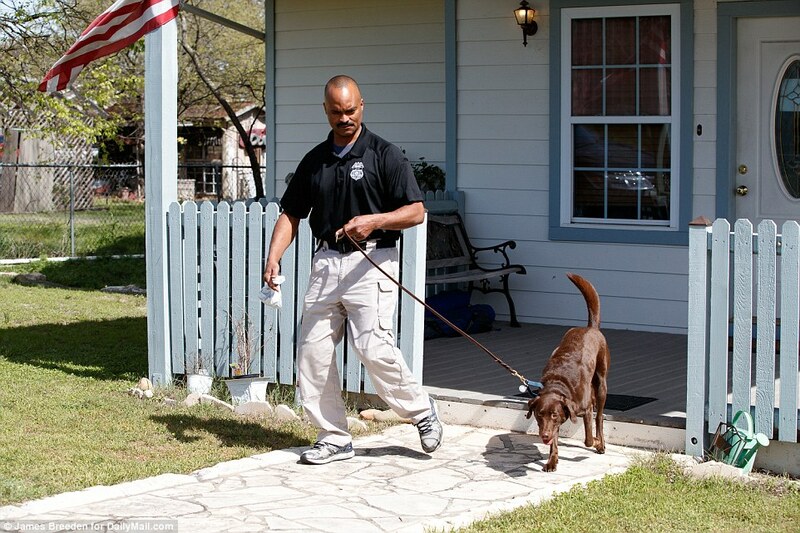 The first three devices were parcel bombs dropped off in front of homes around Austin neighborhoods. The series of bombings bewildered law enforcement officials, who by Sunday began taking the unusual step of publicly calling on the bomber to get in touch and explain why he was carrying out the attacks. Authorities had initially believed the bombings may be hate crimes because the first two victims were black, but they backed off that theory after Hispanic and white victims from different parts of the city were also affected. President Donald Trump had earlier been criticized for his silence over the bombing spree given most of the victims were from the city's historically black and Latino neighborhoods. Unlike other attacks, such as the Pulse nightclub shooting in Florida, which Trump was quick to label an act of terrorism, the president initially remained silent about the Austin bombs. March 2: Police are called to the scene of an explosion in Austin around 6.55am. 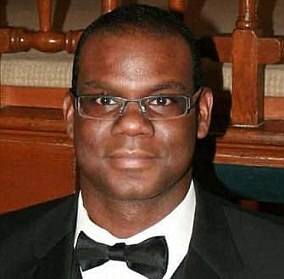 Anthony Stephan House, 39, is found with critical injuries and taken to hospital, but is pronounced dead around 7.45am. Officers say the explosion is 'not part of a larger scheme'. March 12: At 6.45am officers respond to the scene of another explosion, 12 miles south of the first, which happened in the kitchen of a home. 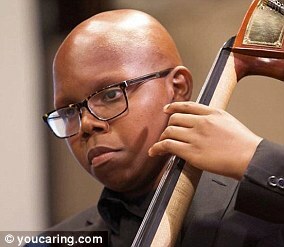 Draylen Mason, 17, is killed in the blast and his mother, aged in her 40s, is badly injured. Just before noon a second explosion is reported, five miles south of the second. Esperanza Herrera, 75, is taken to hospital with life-threatening injuries. Investigators say the two explosions are linked and are also connected to the first blast 10 days prior. 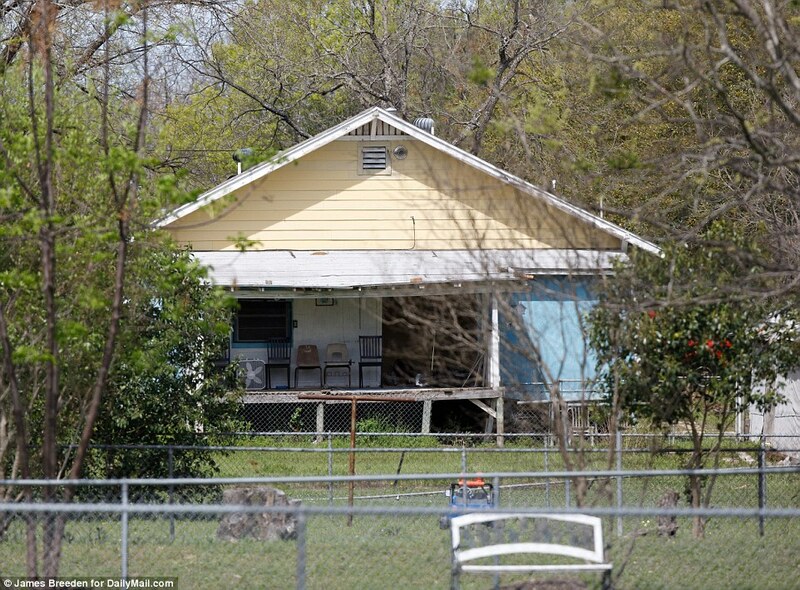 March 18: Two white men in their 20s are seriously injured in south west Austin after triggering a 'near-invisible' tripwire that was attached to a bomb. Police believe the attack is linked to the first three bombings and say it shows the attacker is intelligent and becoming more sophisticated. A reward of $115,000 is offered for information on the serial bomber. March 20: A female worker at a FedEx sorting facility in San Antonio is injured shortly after midnight when a package explodes while being moved between conveyor belts. Police say the package had been posted from a FedEx in the Austin area and was due to return to an address in the city. 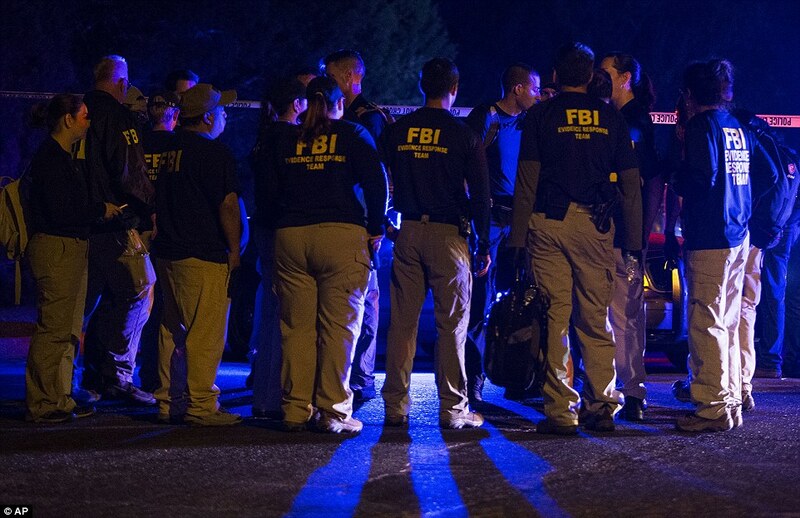 Around 6.20am officers are called to another FedEx facility near Austin airport to reports of a suspicious package. It is later discovered to contain a bomb that investigators say is linked to the previous devices. 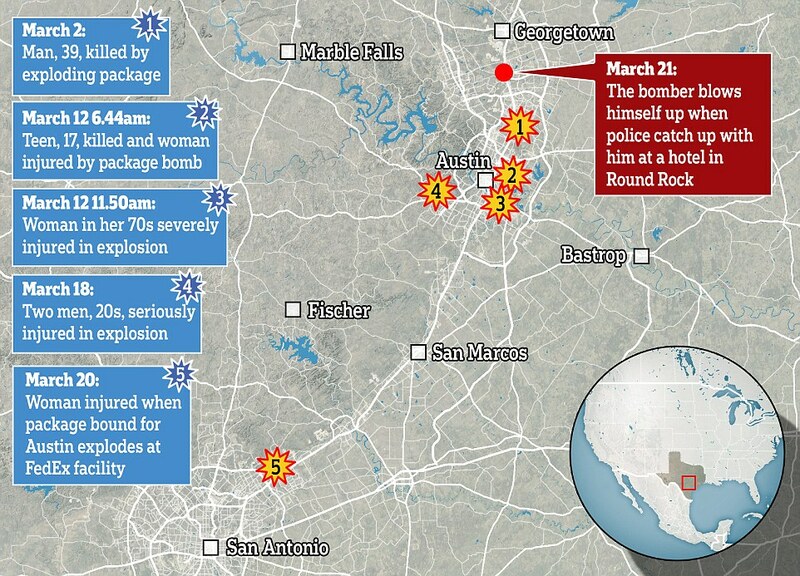 The package was posted from the same address in Austin as the one that exploded earlier in the day. Another explosion is reported shortly after 7pm at a Goodwill store on Brodie Lane, a short distance from where the two previous packages were posted. However, police later say the device was 'old, military type ordinances' that were donated, and is not related to the other attacks. 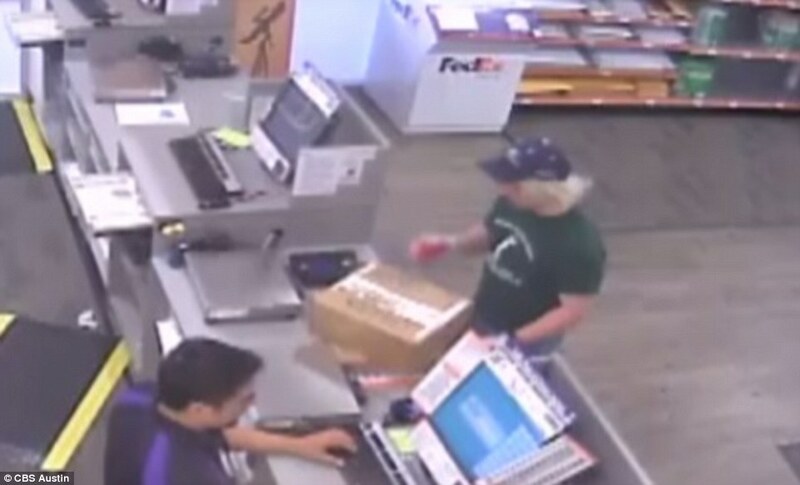 March 21: Police track the bomber to a hotel around 18 miles north of Austin using CCTV footage from the FedEx store and witness description of his vehicle. When they arrive he is sitting inside the vehicle in the parking lot, so they call for backup. 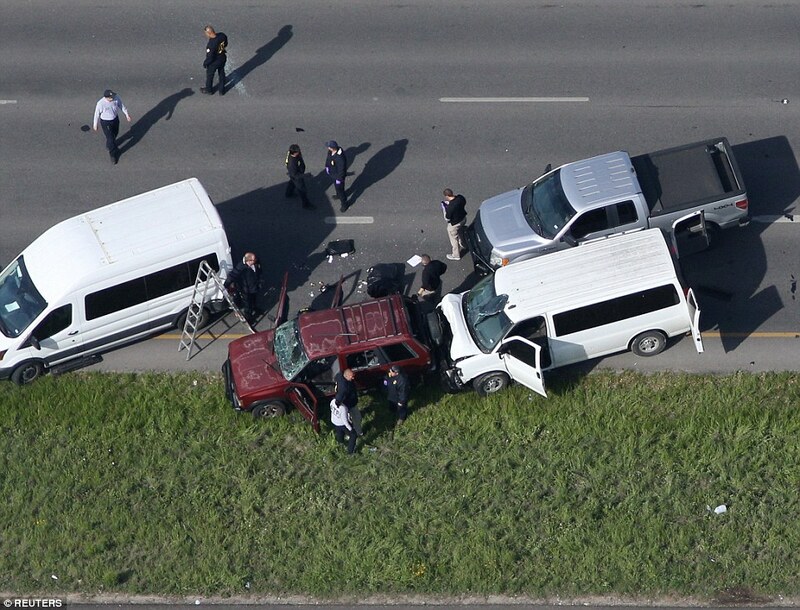 As backup is arriving the vehicle moves away then stops on a frontage road leading to the I-35 freeway. As officers approach the vehicle a bomb detonates, killing the driver and leaving an officer with minor injuries. Belief in mythological entities often gives the deluded believers an over-blown sense of self importance and zeal for missions of death. May all religions implode into nothingness. Racism makes a society almost as ugly as slavery. Even if it was a false flag setup and the guy's a patsy (not likely in this case) I still blame the religious for worshiping their leaders like gods and voting for one of 2 criminal political parties with much blood and deception on their hands. This article makes much (way too much?) of the man being a Christian and a quiet man and that he made the bombs by himself. He may be a patsy, but the writer of this article is being a patsy.